Wildlife Explorer Chic. 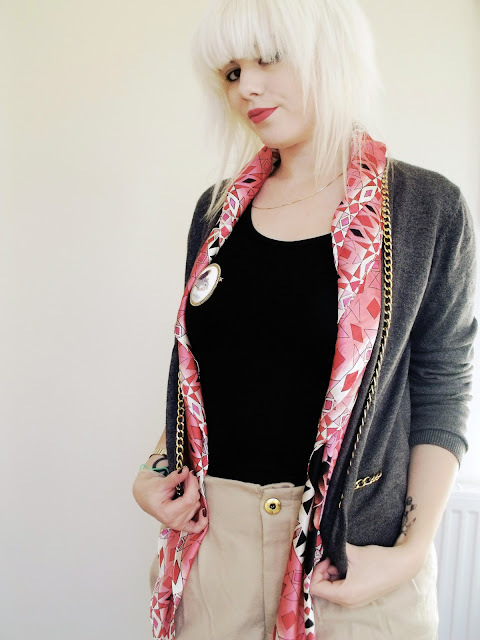 cowbiscuits | UK Lifestyle, Style and Beauty Blog. : Wildlife Explorer Chic. 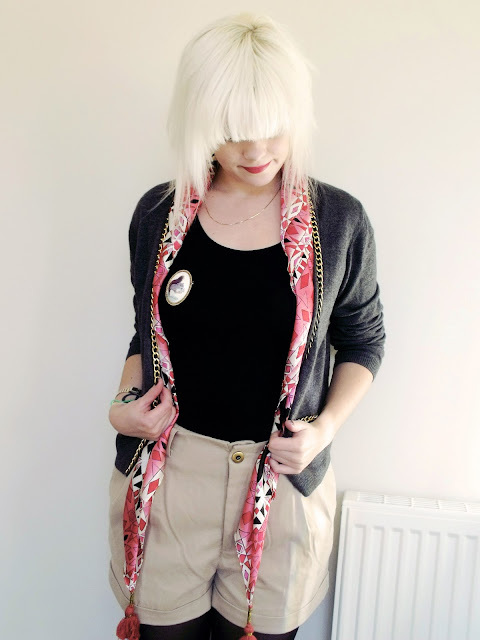 I bought the shorts, scarf and brooch whilst in Manchester 2 weeks ago. Also a BIG thankyou to the amazing Victoria for editing my pics for me because I'm so thick! Yes my animal obsession continues! He was only £2 how could I say no?! The reason I said I felt like the little boy from 'Up!' is because the shorts are Hi-Waisted and a Kaki-Camel colour plus I wore my little Squirrel badge so I felt like a child again going for a bit of an explore - all I needed was a backpack! I went to see 'The Social Network' last night, I did enjoy it I wouldn't go as far as alot of the reviews and say it's the best movie of the year but nevertheless it was enjoyable. My only complain is Justin Timberlake needs to get back to singing and cut his hair - It's very *Nsync circa 1999. Hope you are all ready for Halloween, I'm so excited I can't wait to post pics of my outfit (fingers crossed it looks good!). I love UP, its like one of my favourite films!! i love the chain detailing on the cardi & your squirrel is very cute haha! I was sooo close to buying that squirrel broach, but didnt ): regret it now. Great outfit. I love the high waisted shorts! I haven't seen Social Network yet but I've heard great things, I should really get round to watching it. The outfit's great - I love that the boy from 'Up!' was your inspiration! Haven't seen 'The Social Network' yet, so can't really comment - I'm rubbish at keeping up to date with films, hardly ever go to the cinema! Lovely outfit, brooch is so cute and I love the short! I did a fashion internship in NYC through Uni, wish I was still there now, wandering the streets of Soho or Williamsburg. Bought a lot of H&M there too! I don't know why people think squirrels are pests because they do make a fabulous brooch! love this !!! you don't look like a ups guy no way close your super stylish !!! Love the shorts and the broach! I know everyone has said this but that brooch is too awesome for words! Love it. aww i love up! and your outfit is fab, these shorts are on my wish list! I love your hair colour and cut. Its perfect for you. I lvoe the scarf! It adds such a nice bright twist to the3 outfit. Gorgeous! I saw The Social Network on Friday night for the first time... I did like it. It's just weird to watch a film where there isn't really anyone to like? All the characters were kinda dicks. I did like it though! Can't wait to see your outfit for Halloween! I like so much your cardigan!!! !and of course the clip is sooo cute!!! have to say that I thought the social network was really good and i was loving JT's curly nsync hair, haha. love the scarf and squirrel - can't wait to see your halloween costume! i love that cardigan with the chains ! Ok, so I LOVE those shorts! I really love all the high-waisted bottoms you have been wearing. Like the black ones from Zara too!! And you are NOT thick!! Just cute! laaaaaaave this brooch, definitely made me smile :) . love your hair, it suits you! Would love if you'd check out my blog and consider following back! Love the scarf, very chic! Stray Jewellery + Giveaway winner. MAC Viva Glam - Lady Gaga Lipglass. I Just Dig Woodland Animals + Russell Brand! MAC Venomous Villains - review and swatches. A girl can never have enough lipstick!